I would like your opinion for a future purchase.I currently own a Remington 7 Noiseless I bought because it was in a very good condition (see the picture). It works well but I'm looking for something different. The Noiseless system, which effectively reduces the sound considerably, makes me a handicap in terms of typing and speed. So I'm looking for something more "heavy", more traditional and, so to do, a cult object.I am not DIY enough and do not have enough time to restore a machine. I am aware of the work and the time it takes, not to mention the skills. I know in France a repairer who has restored more than 600 machines. It is on this choice that I would like to have your opinion because I can not decide. As there is no perfect machine but a machine for a use and a person, here are my criteria.1. The quality of typography.The first goal is to use it and not put in a window or on a desk to look pretty. The repairman tells me that the Remington has a perfect typography and characters in very good condition. It is sure that this one will be perfect at the writing level. For the Underwood, as currently it does not work, he can not be sure yet and he tells me that there are not two Underwood with exactly the same typography2. The typing.I attach a lot of importance to typing and feeling (I am a pianist at the base). When you change the piano there are real differences and for me it's the same for a machine. So I'm not looking for the ease of typing but something straightforward, solid, reliable and allow to hit quickly. As I can not try them before, a review would be very helpful. The repairman told me that the Remington 12 is more "flexible", perhaps a little less noisy, with a strike always equal from one machine to another. While he3. The aestheticsPersonally I prefer the Underwood for its side a little more "New Orleans" (the columns) and especially the fact that it is open and sound! A bit like Harley Davidson (I rode 15 years), the real pleasure is in the noise and vibrations! 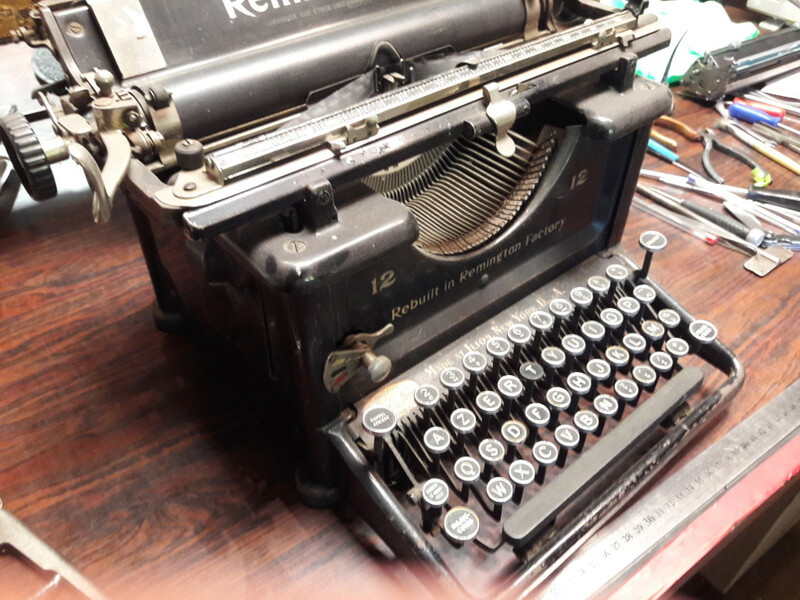 It seems that the Underwood supports adaptable ribbons while for the Remington it must rewind with each change on the original ruban. So a bit more constraining. I also read somewhere that the dismantling of the Remington is more complex. Even if it is not me who will do the restoration, it could happen in the future that I put my hands in grease.5. Value and resale. 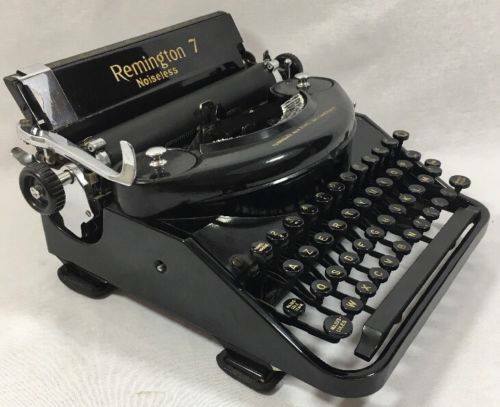 The Remington 12 is less common than the Underwood. So it is more sought after by collectors or they seek the Underwood is more "mythical". And last, the Remington is a "Rebuilt in Remington Factory". I do not know enough about Remington's story. Why this reconstruction? Except with the trolley arm on the left and tabs down, other mechanical differences? =0px:-) and I hope you can answer and give me all the advice as possible. If both machines have been professionally restored, they should be quite comparable in their performance. How loud they are will also depend on the condition of the platen. Have the platens been resurfaced? How much typing do you plan to do? Having a ribbon that is easily replaced is really only a consideration if you do a LOT of typing as a fresh ribbon will last most casual typists a very long time. The "Rebuilt" label is nothing unusual, all the major manufacturers did this. 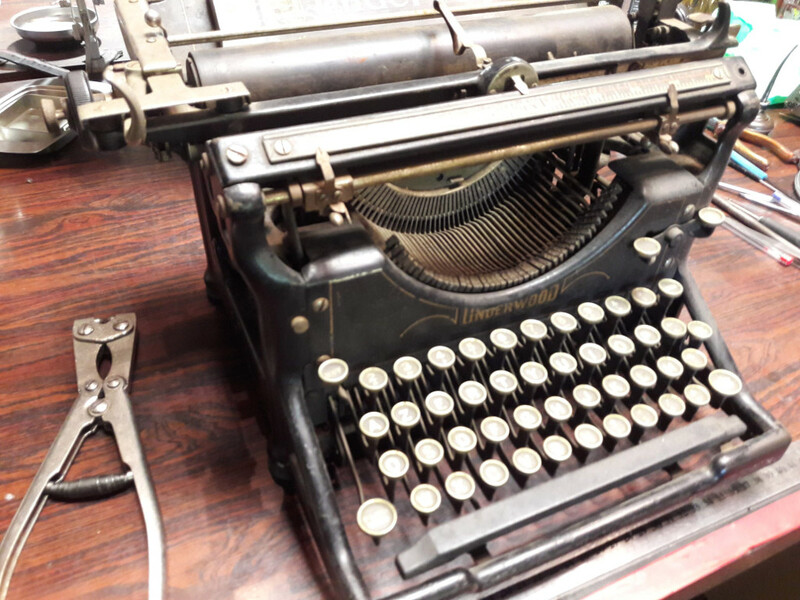 Typewriters were extremely expensive items, and the manufacturers would rebuild tired machines and sell them as an alternative to having to spend the money on a brand new typewriter. If I was making the choice I would buy the Remington, and only because the Underwood is extremely common in my area and I'd want something a little less obvious. In terms of price, this does not come into consideration in the choice. The repairer, whom I trust, is now retired and does it more by passion than profitability. His hourly rate is about $ 5! Actually I thought about this aspect of things for the Remington. I may also want to restore a machine in a while and suddenly I would find an Underwood 5 easier and I would also more easily advice and parts. One guy told me on another forum "For what it's worth, I've never seen anyone sing the praises of a Remington 12 for any reason beyond moderate collectibility.". He's right, that does not mean the Remington is not as good, just that fewer people know it. The repairman already has other requests for the Remington that he reserves me while waiting for my decision. So if he tells me that it's the one he prefers, I must also take it into account. Nobody asked me, but: I own a Remington 16, very similar to a 12, and a number of Underwood 5's in various states, all functional but none professional restored. The Remington seems to have been well maintained in its working life and stored carefully when it was retired. i agree about the Remington being more "flexible" although I never thought about it. if I had to put it into words I'd say it had more of a cushion in the deceleration at the end of the stroke so your fingertips take less of a beating. But it's still mechanically vigorous and a workout for the fingers, perhaps more so than the #5. The Remington is noticeably larger and more steampunk, if you will allow the expression: more external appurtenances and odd visible mechanisms - the net territory on top of the machine approaches a small aircraft carrier. OK, a slight exaggeration. As a pianist I feel you will enjoy the Remington more, the action seems longer and with a more organic accumulation of energy from the stroke. But really this is all personal preference and it is a hard thing to ask to choose one never having played one and relying on other people's descriptions, not even being able to try them out first. i would choose the Remington for all the reasons aforesaid - as mentioned less common, and i think has an action you will enjoy more. It does take up noticeably more real estate, though. But perhaps the choice was already made. Finally I found an Underwood 5 in excellent condition. Affectively I wanted to start with this mythical machine and easier to maintain I think the Remington. But I think that at the level of the striking the Remington is very interesting. It will surely be a part of my modest collection which now also includes a flamboyant Erika M.